In a striking collaboration between the Olivier Award-winning Damien Jalet, who choreographed Hussein Chalayan’s Gravity Fatigue in 2015, and Japanese experimental sculptor Kohei Nawa, Vessel blurs the lines between the human form and its environment. 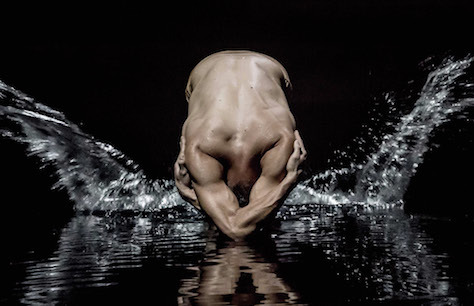 Inspired by the body’s composition predominately being made up of water, the near-naked dancers inhabit a flooded stage, both reflected and hidden by its mirror-like surface. To an electronic score by Marihiko Hara and Ryuichi Sakamoto, seven beings perform strange rituals, exploring the organic structure that floats atop the water, merging together to form a new type of entity in a visually arresting cycle of life and death. Audio Described Performance Wednesday 17 April at 7.30pm Patrons wishing to make use of the audio description should book a headset in advance by calling the Ticket Office on 020 7863 8000. There are a limited amount of stalls seats for partially sighted patrons only available via the phone, please contact Ticket Office for more information. Subject to availability.